This morning I opened my door to be greeted by a friendly face in a bright orange shirt, a member of the FarmBox team dropping off my weekly delivery. I eagerly accepted my bright red Eco-Basket and happy, green FarmBox recyclable bag and ran with them to the kitchen to see what treasures awaited inside. I unwrapped my package to discover beautiful purple peppers, crunchy lemon cucumbers and gorgeous heirloom tomatoes all in mesh bags. There was kale and lettuce, a beautiful head of cauliflower, potatoes and some plums. I was thrilled to discover Lilly’s Eggs and Mary’s Organic Chicken, two products I go out of my way to find in grocery stores. I can’t wait to cook up the Community Seafood Halibut and try the Spring Hill cheese. There were snacks from Ha’s Apple Farm, raw organic milk and fresh juice. A delivery like this inspires you to think of something new and creative to cook for dinner. I’ll let you know what I come up with! Definitely something where I try the Curry Ketchup. What’s different about the FarmBox delivery service is that they bring you the best of local California produce and artisanal foods to your door. Deliveries depend on what’s being harvested and you can log in to see whats available each week and customize your delivery. 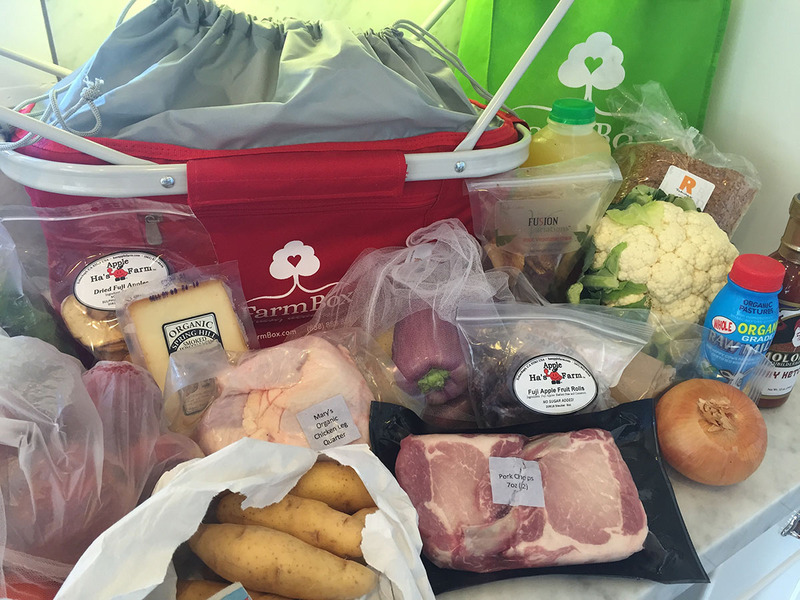 FarmBox has partnered with local farms including Thorne Family Farms, ABC Rhubarb Farms, Finley Organic Farms, Ken’s Top Notch Produce, Lily’s Eggs (our favorite! ), Maggie’s Farm, Powell Farm and many more. Each partner is hand selected! Everything is packed securely and iced well inside their silver envelopes and eco-baskets. An environmentally conscious company, FarmBox asks that you please remember to return your baskets, mesh bags, glass bottles, ice packs and silver envelopes to the driver when he drops off your next delivery. (Otherwise there’s a charge added to your account.) I have to admit I’m tempted to keep a few mesh bags to use in the produce drawer in my fridge. Looks like I’ll owe a few dollars more next month. Why does FarmBox do what they do? I think they explain it best… “We created FarmBox to share our love of eating fresh, local produce straight from the farm with our friends across the LA area! With hectic workdays, weekly appointments and family commitments, we realize that not everyone has the time to visit their weekly farmer’s market—no less a farm!—to find the best fruits and veggies of the season. FarmBox LA is similar to a CSA, a model where consumers purchase a share in a farm to receive a portion of the harvest. However, we differ by supporting dozens of local farmers to bring you the best crops that vary week by week. We guarantee that no two of your FarmBoxes will be identical! We have built strong relationships with our local farmers to ensure that your produce is picked when it’s ripe and bursting with flavor and is grown using sustainable, organic farming practices. FarmBox LA also features local artisan food makers through our online marketplace, whose products can be added to any delivery. While FarmBox does not currently have an app they are a web based company and have a very easy to use mobile version of their website so we’re adding them to our #BusyParentApps posts because we truly believe that FarmBox makes parents lives easier! We hope you will try them out. They are a new addition to our Perks Program. See details of their offer in their listing on our site. While FarmBox is part of our Perks Program, these optinions are our own!